But here’s the rub. According to James Geary’s book I is the Other, metaphors are not only inescapable, they are essential to life and language. The average person uses one metaphor every 10 to 25 words, or about six metaphors a minute when speaking. I’ve already used three glaring metaphors: ‘blight on language’, ‘cloud precision’, and ‘the rub’. And even in denouncing metaphors, Locke and Berkeley were inextricably bound to them. Locke uses ‘insinuate’ which comes from the Latin word for gulf or cove and is a latent metaphor for an idea penetrating the brain like a boat gliding into a harbour, while Berkeley uses ‘abstain’ which comes from the Latin term to hold something and since ideas can’t be physically held in your hand, it too is a latent metaphor. The reason our language is embedded with metaphors is because they are what allows our language and consciousness to evolve. The human brain is built to seek out patterns because understanding patterns – lions tend to maul, fire tends to burn, hemlock tends to poison – helps eliminate risk and ensure survival. Whenever a person encounters something new, the brain tries to fit it into existing patterns to make sense of it: Aha! Tigers are like lions! Thus, all new experience is metaphorical because it is understood through the lens existing knowledge. Carl Jung goes so far as to suggest a few archetypal experiences are the platform from which all human knowledge and understanding metaphorically arises. 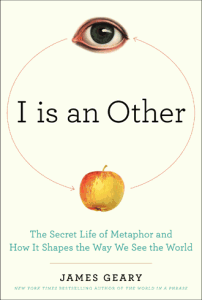 Geary’s I Is The Other: The Secret Life of Metaphor and How It Shapes The Way We See The World is a fabulous exploration of these ideas. It is vital reading for anybody who works with language or seeks insight into how human consciousness evolved. Of course, a little disclosure is required: Geary is my editor at Ode Magazine and a hell of guy; but even if he was a stranger with a sinister reputation I would emphatically recommend his book. Special bonus: a great video of James speaking at a TED conference can be seen here: james_geary_metaphorically_speaking.html.